Use aluminum oxide wheels for grinding and cutting most ferrous metals. The A24-RBF spec is a fast cut wheel, and the A24-UBF is a harder long life spec. These are premium grade wheels for the toughest applications. 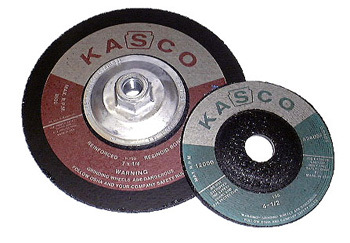 Note: Wheels 1/4" thick are normally used for grinding with the intent of metal removal. Wheels 1/8" thick are used for light grinding and cutting. Select the thickness you need from the categories shown in the left margin. Be careful to pick the right thickness for your application. The wheels on this page are 1/4" thick grinding wheels. Click on the link left for 1/8" thick wheels for light grinding and cutting.